Municipal workers trying to fix broken water pipes in Turkey's northwestern Çanakkale province found three ancient sarcophagi from the 8th century B.C. during the excavation. One of the two sarcophagi which were opened on Wednesday has gold jewelry, while the remaining one is expected to be opened on Friday. 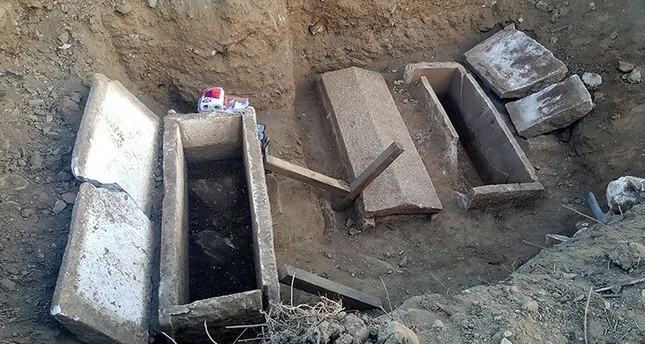 According to reports, the sarcophagi were found in Kemer Village in Biga district and local authorities immediately informed the gendarmerie and archeology museum officials regarding the issue. The sarcophagi are thought to be an extension of the necropolis (ancient Greek cemetery with elaborate tombs) in the ancient Greek city of Parium, which is only two kilometers away from Kemer. Parium was founded in 709 B.C. and served as a 'customs station' with its two harbors. Archeologists arrived at the excavation site to unearth the sarcophagi but told the locals that they would not be able to open the coffins until Wednesday. The claims by some who said that they saw gold jewelry inside a sarcophagus were proved to be correct when officials opened two of the sarcophagi, revealing a handful of gold beads, a ring, three bullet-sized gold pieces, two brooches and a mirror without a handle. 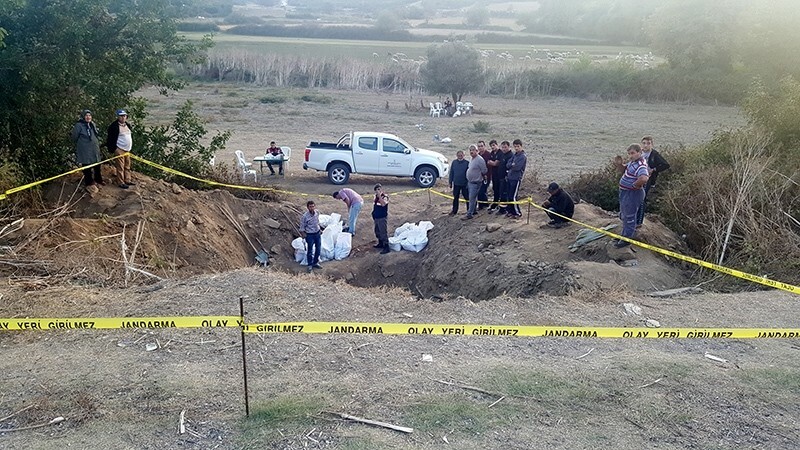 İsmail Güler, who owns the field in which sarcophagi were found, told the press that he never thought such historical artifacts would be found in his land. "I hope this will also benefit us,'' he said. Biga Peninsula hosted many civilizations including Kumtepe (circa 4000 BC) and Troy (circa 3500–3000 BC). Archaeologists in Turkey, which has historically been a home to many civilizations, frequently find significant historical artifacts throughout the country, in efforts to shed light on early human civilizations.